Luxury brand DXV, part of the global LIXIL Corporation, has unveiled of the DXV 2017 Design Panel, which includes Canadian Alison Habermehl. Principal of Waterloo’s Habermehl Design Group, and editor of the blog HD Stylestudio, Habermehl’s portfolio has evolved into an impressive collection of stunning, high-end, carefully articulated and customized projects. Habermehl was recognized for her stunning interpretation of a sleek Toronto bathroom, which incorporates pieces from the DXV Contemporary Movement, and was directly inspired by Toronto’s contemporary architecture. Capturing the distinctive style of architecture and design from the four global cities of Florence, Casablanca, Copenhagen and Toronto, this year’s Design Panel members designed exquisite bathroom settings that highlight timeless DXV fixtures and features. DXV selected this year’s Design Panel members ―who also include Corey Damen Jenkins, Kati Curtis, and Michele Alfano ― from an impressive field of gifted and experienced designers. The panelists have each distinguished themselves by earning recognition from influential design award programs, sharing their expertise in high-profile publications and directing successful design businesses. Alison Habermehl’s “Contemporary Penthouse” — In her sleek Toronto bathroom, Habermehl selected a rounded shower and dark tiles to create a gracious and soothing atmosphere. Strategic lighting and soft colours add warmth and quiet drama to the room’s clean lines. 4-4-4 The DXV bathroom designed by Michele Alfano suggests life on a houseboat in the chic city of Copenhagen. The design flexibility and sleek curves of the DXV Modulus collection, scheduled to launch this November, emphasize thoughtful design and lend an air of Nordic coziness to the space. “In the future, I think we’re going to see a softer, more feminine style—curvaceous design, no sharp corners, everything is very sensuous,” Habermehl predicts. A perfect expression of this approach to design: the cool, sloping shape of the Lyndon freestanding tub is set before an oversized mirror, providing a focal point for the room. Inspired by the striking contemporary architecture in Toronto, Alison Habermehl created this DXV “Contemporary Penthouse” bathroom that highlights pure form and precision in a gracious and soothing space. The room’s elements celebrate clean but curvaceous design lines, typified by the exquisite Lyndon freestanding soaking tub. Percy widespread cross handle faucets perch above two different sizes of undercounter lavatories from the Pop collection, increasing usability without threatening the room’s minimalistic origins. 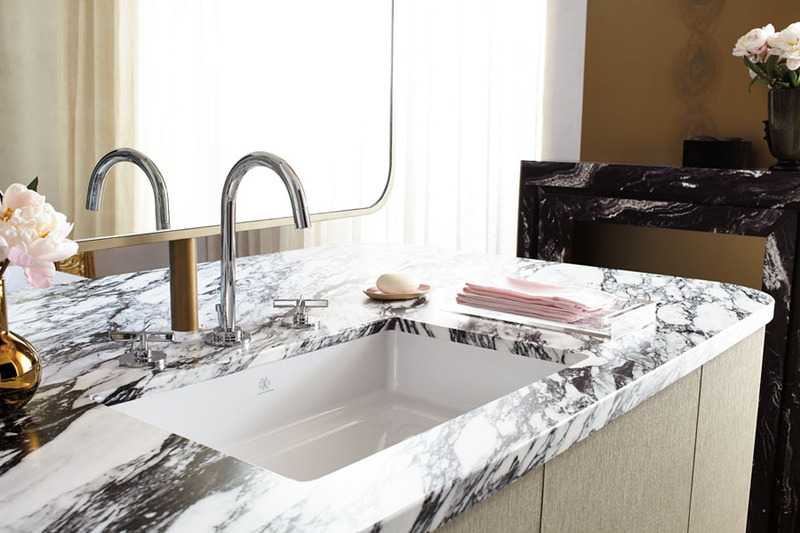 “The Percy faucet has a wonderful tactile nature,” said Habermehl. “I think this encourages you to think a little more about both the faucet and the water you’re using, and appreciate it more, because you use it so often.” For more on Habermehl and her designs, visit www.habermehldesigngroup.com.